In 2 hours time, you've completely sabotaged muscular recovery AKA you wasted 45 minutes of your time to workout. The "window of gains" the guys from barbell shrugged term it, has now closed. You may think relaxing on the couch is part of the recovering process, but how you ever wondered why you are sore and stiff the day(s) after workouts? Or why your major lifts (bench, squat, deadlift, etc.) are still within the same 10 pounds for the last 7 months? If you don't already listen to the barbell shrugged podcast, then you should probably subscribe. The window of gainz is the time after a workout when the body is primed for food. The muscles are starving for carbohydrates (CARBS) and protein. To put this into perspective, imagine you are on a sandy beach. Kids around you are digging a hole in dry sand; as more sand is put in a pile, the sand from the top and sides starts spilling back into the hole. Still, the kids keep digging away without the hole getting any deeper. At some point, one of the kids realizes getting the sand wet keeps the sand from falling back into the hole. Well the dry sand, wet sand is exactly what happens inside of the body. The sand is carbohydrates (CARBS) and wet/dry is the body's ability to store the CARBS in the right places. When the body is "dry", all the "ideal" locations for CARBS are filled...so the CARBs have to spill over into Adipose tissue (fat cells, not to be confused with actual FAT we eat). When the body is "wet", the muscles are STARVING for replenishment and the CARBs are stored in all the right places. The types of CARBs in the above situation are your; oats, banana, berries, rice, quinoa, etc. Why CARBS? CARBS get a bad rep from the media, one article after another. The truth is CARBS are the quickest and "cheapest" fuel source during most workouts, so the muscles store as many CARBS as possible to ensure a readily available fuel source. PROtein makes up a huge majority of our body weight. It's an essential building block to a lot of organs (muscle) and processes (movement). You are doing your body an injustice by limiting protein supply throughout the day, especially after a workout. WOG meals should be 50/50 - PRO/CARBS. The WOG meal is your opportunity to eat that oatmeal, rice, quinoa, banana, berries, dried fruit, etc. Ever CARB that is not part of your daily low-carb meal plan. LOOK AT AMOUNTS IF YOU LOOK SOFT. 2. Restore body's pH levels. For the sake of simplicity, eat a banana, sweet potato, red potato or raisins after a workout to restore the balance. Your body will thank you. Don't get too caught up in the testing kits or anything like that, however, if you do think you have a huge pH imbalance, then a good visit to your physician could clear the air. If you're interested in learning more about this topic, a good book is the Paleo Diet for Athletes. 3. Foam roll after workouts. Muscle soreness has always been attributed to lactic acid build up in the muscles, but actually the soreness is caused by micro-tears within the muscle fibers (1). Lactic acid is actually a hero when hitting that last rep or sprint, the acid is recycled into the energy cycle used to power movement. The muscle tears cause a rebuild process, anabolism, which fuse the tears and add a little extra to patch the gaps. (Which is where hypertrophy, muscle growth, comes from). Where the body falls short in the repair process, is forming straight, smooth patches to these tears. Overtime these patches build and build, until what we know as "knots" form. 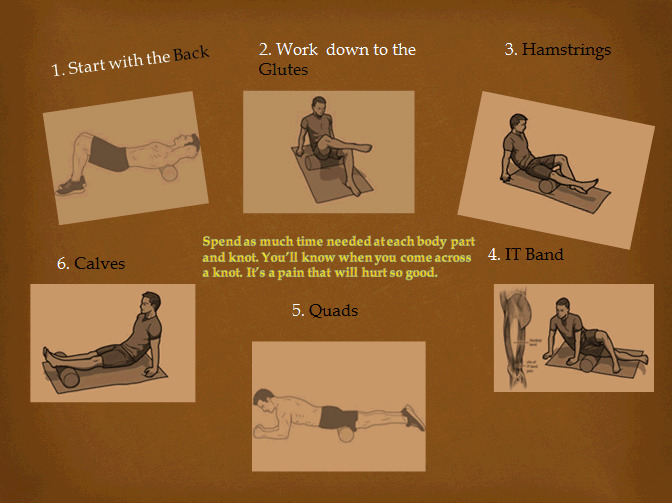 The best way to help the body build more efficiently, is by hitting the foam roller or lax ball. Post workout is usually best, since the muscles are warm and have been worked. Use the lax ball before a workout, only if you have a current or recent injury or an area is extra stiff. mobilityWOD is also a good resource here. 4. Stretch AFTER the foam roller AND more often. Now that you've worked out the tension-causing knots with the foam roller and LAX ball, the muscles are primed for stretching. Foam rolling and stretch, together, improve the body's ability to move. The better you are able to move, the more you will get out of your workouts.